Is your company experiencing the vicious circle of IP blacklisting, unhealthy server reputation and high numbers of support tickets? MailChannels protects your servers against email abuse so that you get the best email deliverability for your customers. Learn more about MailChannels in the video. Remember back when email was easy? Like, when you could throw a Sendmail server up on a Linux box and get your mail delivered? To the inbox? Today, cyber criminals are constantly hacking into your user accounts and taking over your servers. Then they send their spam and phishing attacks out of your IP addresses, wrecking your network reputation and getting your network blacklisted everywhere. This frustrates your users, who clog your support desk with calls, eating up precious time that could be better spent doing more important things. You know, like growing your business? This is why you need MailChannels. MailChannels delivers all your email, stopping spammers in their tracks. And when we find a spammer, we let you know about it. So you can disable the account they just stole, and hopefully find out how the spammer got in in the first place. This makes email receivers happy, and more likely to deliver your email into their users’ inbox. It’s simple, really. 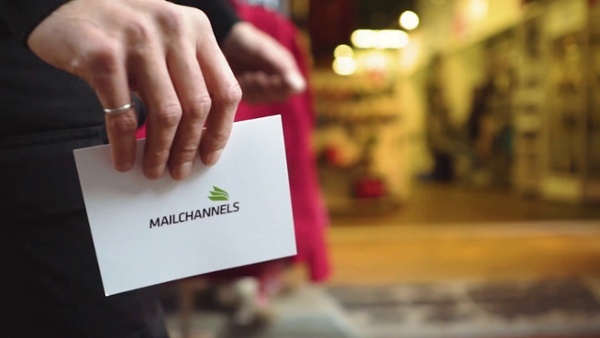 MailChannels solves email delivery so you don’t have to. Simply smart host your mail server over to ours and let our email experts do the rest.